New article by myself – Steven Mill – about biomass fuels and its role in electricity. Enjoy and leave comments! Why use Algae Biomass Fuel Cells for Electricity Generation? Electricity generation using biomass fuels has captured a lot of attention these days. Many countries are inclined to start large-scale research projects so that the microbial fuel cells could be installed to fulfill the requirements of both domestic and industrial sectors. First of all, it is a renewable source of energy because the biomass i.e. 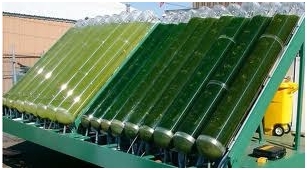 algae is continuously being produced naturally and can be gained easily. Secondly, it is cheap as compared to other forms of energy. The fuel is considered as “waste” material and is almost priceless whereas, the fuel cells are also less costly and their maintenance cost is also low. Third reason is that the energy gained is environmental friendly, clean and green. The mechanism is very interesting because many things are already set in their place by Mother Nature. The algae involved make their own food via photosynthesis. The green colored pigments called chloroplasts present in the algae cells trap sunlight and perform a process called “catalysis”. In this process, water is broken down to oxygen, hydrogen ions and electrons. The electrons produced gain some energy during this process and move to a higher energy level. Later on, they are captured by proteins to form carbohydrates. But, if these electrons are intercepted on their way to proteins and harvested through a proper channel, then electricity could be generated. 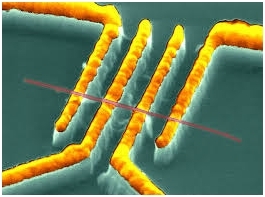 Scientists developed specifically modified gold electrodes for this purpose. A gold electrode is inserted gently into the membranes of an algae cell such that the cell does not die. When photosynthesis starts and electrons achieve a high energy state, they start moving and are attracted towards the gold electrode. The electrode then channelizes them to an outside circuitry and this way current is generated. Activated sludge is also required in this process and is of great importance. The sludge is composed of aerated sewage or biological waste and aerobic microorganisms. It is placed at anode and is used as a nutrient source and an inoculum for nurturing algae. During the experimentations, several concentrations of algae biomass were tested for electricity generation mainly ranging from 1-5 g/L. Amongst these concentrations, 5 grams of algae per Littre fuel generated highest voltage of about 0.89 volts. The power density gained was about 1.78 W/m(2) for a 1000 ohms of electric resistance. Pre-treated biomass and sludge were also used at anode. But the power output was lesser in this case. In another line of experimentation, spent algae biomass was replaced with whole algae biomass as a substrate, but the power output was still lesser than expected. It is this work and experimentation that has contributed a lot of to the development of microbial fuel cells with greater efficiency than other systems. The first problem is that the electricity produced by one cell is only about one picoampere which is too minute. It would require about a trillion cells to generate voltage equal to that of an ordinary AA battery. 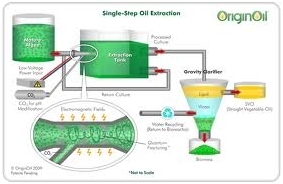 Moreover, the cells used in the process die after an hour and energy production is stopped. This may be because of the incision made by the electrode or because of the fact that the cells do not get enough electrons to carry out some vital processes like glycolysis and Krebs’s Cycle to produce ATPs. If enough ATPs are not produced then the cells do not gets enough energy to survive and they ultimately die. Another problem is that the insertion of electrodes takes some time and tapping a large number of cells is a hectic process. The remedies or solutions to these problems are also proposed by many important figures of this field. For instance, the plants chosen for this purpose should have larger chloroplasts so that the collecting area is large. The electrodes should also be better so that more electrons could be tapped. Thus with a long-lasting plant and better collecting ability, more electrons can be channelized and thus more power can be generated. This cutting-edge technology is pretty amazing, but there is still a lot of work and experimentation that needs to be done in order to overcome the hurdles and create the fuel cells that are both efficient and commercially feasible. or copy this trackback: http://engineering.electrical-equipment.org/others/use-of-algae-in-electricity-generation.html/trackback from your own site.